The German Commission E has approved clove oil as a topical anesthetic and for inflammatory changes of the oral and pharyngeal mucosa. The essential oil from clove has been used for its medicinal properties, including its antimicrobial, antioxidant, antifungal, and antiviral activity, and also has been shown to display anti-inflammatory, cytotoxic, insect repellent, and anesthetic properties. Eugenol, a constituent of clove, is an integral part of the dentist's kit due to its analgesic, local anesthetic, anti-inflammatory, and antibacterial effects. Clove bud has Generally Recognized as Safe (GRAS) status with the U.S. Food and Drug Administration (FDA). Clove bud extract, clove bud oil, are included in the FDA's "Everything Added to Food in the United States" (EAFUS) list. As a mosquito repellant, 0.1 milliliters of clove oil of different concentrations (5-100 percent) has been applied to exposed skin. Analgesics: The clove constituent eugenol may inhibit prostaglandin biosynthesis and thereby depress pain sensory receptors (305). Analgesic activity of various constituents of clove, including eugenol and beta-carophyllene, has been shown in animal study and in vitro (306;​307;​308;​309;​310;​311;​312;​313;​314). Anesthetics: Based on a randomized trial, clove gel may be as effective as oral anesthetic benzocaine 20% gel (207). Anesthetic activity of various constituents of clove, including eugenol and beta-carophyllene, has been shown in animal study and in vitro (315;​316;​317;​318). Anthelmintics: Eugenol showed potent anthelmintic activity in the Caenorhabditis elegans model in vitro (319). Antibacterials: Clove oil and a constituent of clove, eugenol, have demonstrated antibacterial effects against a wide range of bacteria in animal study and in vitro (1970-1989 ((320;​321;​322;​323;​324)), 1990-1999 ((325;​326;​327;​328;​329;​330;​331;​332;​333;​334;​335;​336)), 2000-2010 ((14;​15;​16;​17;​18;​20;​29;​31;​32;​64;​337;​338;​339;​340;​341;​342;​343;​344;​345;​346;​347;​348;​349;​350;​351;​352;​353;​354;​355;​356;​357;​358;​359;​360;​361;​362;​363;​364;​365;​366;​367;​368;​369;​370;​371;​372))), although conflicting results exist (373). Anticoagulants and antiplatelets: Clove has been associated with inhibiting platelet aggregation (146;​147;​148), increasing INR (137), and report of disseminated intravascular coagulation (137). Polysaccharides isolated from clove may have antithrombic effects in vitro (149). Therefore, use with other anticoagulants or antiplatelet agents may result in additive effects and increased bleeding risk (203). Anticonvulsants: In animal research, essential oil of clove may induce anticonvulsant activity (374;​375). Antifungals: In laboratory study, clove oil and eugenol has demonstrated antifungal activity in animal study and in vitro (19;​20;​20;​25;​58;​348;​348;​376;​377;​378;​379;​380;​381;​382;​383;​384;​385;​386;​387;​387;​388;​389;​390;​391;​392;​393;​394;​395;​396;​397;​398;​399;​400;​401;​402). Antihistamines: According to animal and in vitro evidence, clove, specifically the eugenol in clove, may have antihistamine activity (403;​404;​405). Anti-inflammatories: Based on in vitro and animal evidence, eugenol may act as an anti-inflammatory agent (27;​314;​406;​407;​408;​409;​410;​411;​412;​413). In animal study, eugenol possessed greater antipyretic properties than acetaminophen when given intravenously in small doses to rabbits (414). Antilipemics: In healthy humans, 150mg of eugenol daily for three weeks did not increase plasma apo A-I, apo A-II, HDL cholesterol, or HDL phospholipids (415). Although in animal research, clove aqueous extract reduced serum cholesterol and TG levels (301). Antineoplastics: In laboratory and animal evidence, eugenol may display features of apoptosis (9;​416;​417), and eugenol and other clove constituents may display antimutagenic or antiproliferative effects (33;​418;​419;​420;​421;​422;​423). In vitro, clove extract may reduce intracellular cAMP levels and modulate cell signaling through protein kinase A (424). There is a lack of available human data for interactions with clove and antineoplastics. Antioxidants: According to review and in vitro and animal research, clove essential oil, extracts of clove, and eugenol may exhibit antioxidant activity (244;​301;​402;​452;​453;​454;​455;​456;​457;​458;​459;​460;​461;​462;​463;​464;​465;​466;​467;​468;​469;​470;​471;​472;​473;​474;​475). Antiparasitics: Based on in vitro evidence, clove may exhibit trypanocidal activity against Trypanosoma cruzi epimastigote and bloodstream trypomastigote forms by inhibiting parasite growth (425). Based on in vitro study, adulticidal, nymphicidal, ovicidal, and general antiparasitic activities were observed with clove oil (68;​70;​426;​427;​428;​429;​430;​431;​432;​433), and eugenol has demonstrated acaricidal activities (6;​7;​434;​435). Antispasmodics: According to secondary sources, clove may act as an antispasmodic. Antivirals: Based on in vitro evidence, clove essential oil and eugenol may possess antiviral properties against herpes simplex virus (HSV) (436;​437), hepatitis C virus (HCV) (438), and human cytomegalovirus (CMV) and murine CMV (MCMV) (439;​440). CNS depressants: In case report and review, CNS depression has been reported (4;​253). Fertility agents: Based on in vitro and animal evidence, eugenol and clove oil may exert a potent spermicidal action (140;​141). Hypoglycemics: Hypoglycemia was noted after the administration of 1 teaspoon of clove oil to a seven month-old infant (4). In animal research, eugenol demonstrated antidiabetic effects (139), although conflicting animal evidence exists (302). Hypotensives: Based on animal evidence, eugenol may decrease arterial blood pressure and myocardial contractile force (142;​143;​144). Immunosuppressants: Based on in vitro study, eugenol may inhibit macrophage function and modulate immune reactions (151;​152;​153). Based on in vitro and animal study, clove or its constituents have demonstrated other immunomodulatory effects (154;​155;​156). Clove administration to mice did not, however, influence the Th1/Th2 cytokine balance (157). Insecticides: Significant correlations among adulticidal, nymphicidal, and ovicidal activities against Trialeurodes vaporariorum (greenhouse whitefly), the cockroach, the garden chafer (Phyllopertha horticola), Megalurothrips sjostedti Tryb., the Japanese termite (Reticulitermes speratus Kolbe), the Formosan subterranean termite (Coptotermes formosanus Shiraki), Meloidogyne incognita (Kofoid and White) Chitwood, Leptotrombidium chiggers (larvae), and the cotton leaf-worm Spodoptera littoralis (Boisd.) were observed with clove leaf oil (68;​70;​426;​427;​428;​429;​430;​431;​432). 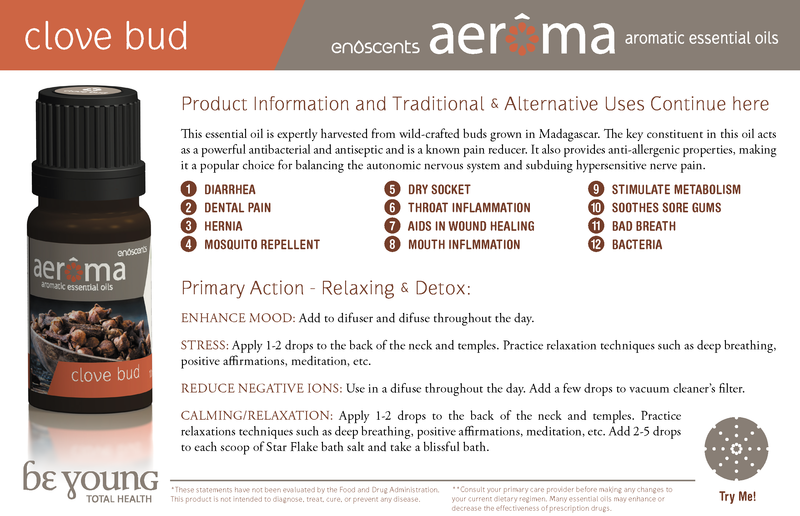 Eugenol has demonstrated acaricidal activity against house the dust mites Dermatophagoides farinae and Dermatophagoides pteronyssinus (6;​7;​434;​435), and to repel mosquitos (446;​447). Clove oil has been used to control Varroa jacobsoni (Oudemans) infestation in honeybee colonies (433). Phytoestrogens: In vitro, eugenol has been shown to exert antiestrogenic effects and was able to displace [(3)H]17beta-estradiol from isolated alpha- and beta-human estrogen receptors (150). Vasodilators: Based on animal and in vitro evidence, eugenol from clove may have vasorelaxant properties (449;​450;​451).